The Great Dane is a large breed dog that is very gentle. The breed is one of the tallest domestic dogs on record. He has a noble and regal appearance that makes everyone stop and stare. The Great Dane is often referred to as the Apollo of all dogs originating in either Germany. On average, the Great Dane males are 30 to 34 inches tall and weigh around 120 to 200 pounds. The females are 28 to 32 inches and 100 to 130 pounds. The Great Dane coat is short, thick, smooth and has a glossy appearance. The colors of the fur can be black, blue, brindle, fawn, harlequin, mantle, and merle. The Great Dane loves everyone and is especially great with children. He is gentle, sweet, and affectionate. He must be around people to truly be happy. Even though he is not big on barking, he is a good watchdog and will bark when it is necessary. Apartment life can be fine for the Great Dane; however, a small yard is best, as he will be able to get the exercise he needs. The Great Dane may be a gentle breed; however, he will need consistent and firm training in order to know his place in the family. Those that are not trained may become the leader of the pack, so to speak, which can lead to aggressive behavior. Grooming The Great Dane is easy to groom, due to his short hair. He should receive regular brushings with a bristle brush and only bathed with dry shampoo when necessary. The nails should be trimmed regularly. You should feed your Great Dane a high quality dog food. After he/she is full-grown, they should be placed on a low protein diet. At the age of six months, your Great Dane should be fed three to four times daily. At full growth, he should be fed at least twice per day or even three to four according to his activity. 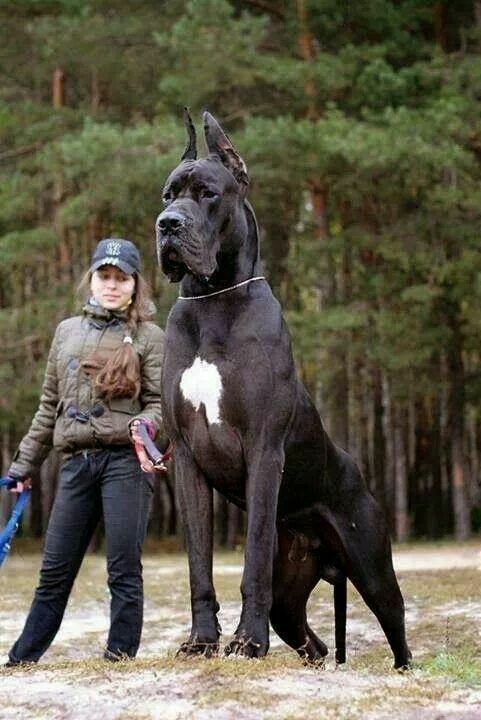 The Great Dane needs plenty of exercise and long walks on a daily basis are necessary. It is best not to jog with your Great Dane until he is one year of age as he can injury his legs until he is fully-grown. The Great Dane is prone to a health problem known as bloat, hip dysplasia, congenital heart disease, dilated cardiomyopathy, and tumors. The life expectancy of the Great Dane is around 8 to 10 years; however, some have lived longer with proper health care and breeding.